Sharing is caring, or so they say. 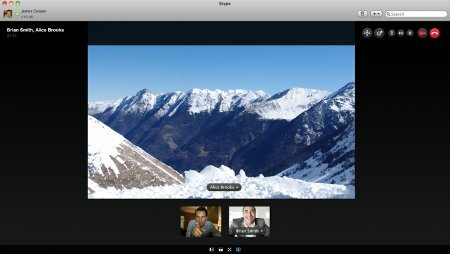 Skype, the VoIP giant that was purchased by Microsoft, has not missed out on that particular adage, hence leading up to Skype 5.2 update for Mac which will deliver group screen sharing – something its predecessor failed to deliver. This new update would mean group communication being made easier than ever before, since you can share your display during a group video call. This is the perfect situation whenever you have something to troubleshoot, and since a picture is worth a thousand words, doing so over the screen is easier than combing through lines of fix-it text. It must be noted that this is a spin-off of what has been available for some time already – screen sharing within a one-to-one Skype call. Apart from troubleshooting, there are numerous other reasons on why group screen sharing is cool – imagine making a document presentation to colleagues who are separated by thousands of miles, or to share holiday photos with friends and family? Sounds too good to be true? Well, since there is no such thing as a free lunch in this world, the same applies to Skype 5.2 update for Mac. If you ever want to take advantage of group video calling and group screen sharing, at least one of the call participants will need to have a Skype Premium subscription. Those who are curious can always give the classic free seven-day trial a go. Multi-tasking folks during a video call will definitely fall in love with the introduction of video in the call control bar. Imagine being in a video call, but you need to attend to another program urgently – just make the switch, and the person whom you’re talking to can still be seen. Other functions such as hanging up or muting the conversation can be done from the call control bar. Anyone downloaded Skype 5.2 update for Mac already? How do you find it?